My bad, was going off the last map where it was empty...I'll take O9. trouble7332 wrote: My bad, was going off the last map where it was empty...I'll take O9. So then, he doesn't attack mucker#4 with melee weapons? Ara moves to M8. "I'll take care of this last one, but I'm assuming someone is going to help out a bleeding brethren soon..." He then attacks mucker #4 with his short sword. Ok. It looks like the quick wood elf has enough movement to do that. As Ara begins to step away, out of the bullywug's threat zone, the mucker takes an Opportunity Attack. 21 to AC is a hit! Ara suffers 8 piercing damage. The ranger succumbs to his wounds and falls prone and unconscious. Please make a death saving throw (on your next turn). Nok hops over Ara's corpse (10ft) and slides up to M-9 (10ft). He will avenge the fallen elfing with his diminutive fury! so if the first swing hit, but didn't kill, Nok doesn't get his SA bonus again, so only 8 slashing. But if the first one missed, he can use SA on this one. Hold your horses, little guy! In that case (and you would have needed a 15 to hit), Nok finishes off the mucker with his first strike. The halfling attempts to hide. But he can't hide at M-8, since that is where Ara dropped. Combat is over! For now... Though I would hardly call the Toadwallow Caverns "cleared." For ease of gaming, we will stick with initiative. Ara is not a corpse, only unconscious and bleeding out. I need a death saving throw when his turn comes up again. But of course someone will probably try to heal him before then. Bru will quietly move to J-11 and peel around the corner to see what's ahead. Josef909 wrote: Bru will quietly move to J-11 and peel around the corner to see what's ahead. Bru peeks around the corner. It is quite dark in the cavern. He can sort-of see the front part of a dragon skull around the bend. How about a Perception check? Drusus quietly says "I will take point, but we will need light"
Bru doesn't notice any movement. Somewhere in the cavern he hears a dribble of water. can Nok see or hear anything? Quxx moves to M-8 and readies the action: cast spell HELLISH REBUKE; condition = enemy appears that he is able to target with the spell. Chris wrote: can Nok see or hear anything? Technically skill checks happen on your turn, but you guys are currently out of combat so I'll be more lenient. Nok can't see much from his current position. Like Bru, he also hears the dribbling of water. He grabs the body of one of the muckers, he pours a full container of oil onto it and will move to the cave mouth with the intent of throwing it into the room with the dragon head. (fling it around the corner, so to speak). Let me know if he needs a Str. check on this (he has a 19 str). As soon as it hits... light it up with a Firebolt and then get ready to move in. Cyc steps to N-8 and casts Cure Wounds on Ara. "Ya can have a nap later, son. We're still workin' here." Cyclone advances through his compadres to L-6. Perception Check? Assuming he spies no immediate threat, on his bonus action he will direct his Spiritual Weapon to K-6. If a threat is spotted, he may direct the mace to a different location. DM please advise. Cyc gives some magical healing to Ara. The ranger is no longer in danger of bleeding out (so no need for a death save). The dwarf moves to a spot where he can take a gander of the next wide chamber. A giant dragon's skull dominates this damp, 15-foot-high cave. You see no other remains, suggesting that the skull was brought here from elsewhere. Beyond the great skull, a dribble of water pouring through a crack in the ceiling forms a shallow pool nearly 20 feet across and 10 feet wide. Cyc doesn't notice any movement inside the cave. Please be aware that Cyc's spiritual weapon lasts 10 rounds. I don't recall what round it came out in. 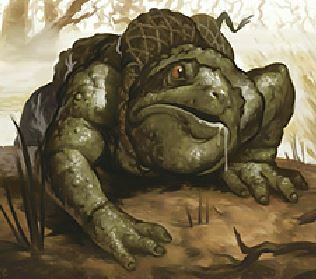 Drusus douses a bullywug corpse with oil and tosses it around the corner. No need for a strength check unless he's targeting a specific square. Go ahead with your Firebolt. Please specify Drusus' position. Firebolt - it should just hit shouldn't it? I'm not sure where to find this but it's just a corpse, no defenses? He makes sure to sheath his swords, nock an arrow into Death's Whisper and walks over to L13 so that he can see both entrances. DM question: How many HP does Ara now have? Cyc added 7hp with his healing, then I added 9 with mine and I had 1hp when mortally wounded? So 17hp currently? Ara was at 6 HP when the mucker spear-stabbed him for 8 damage. 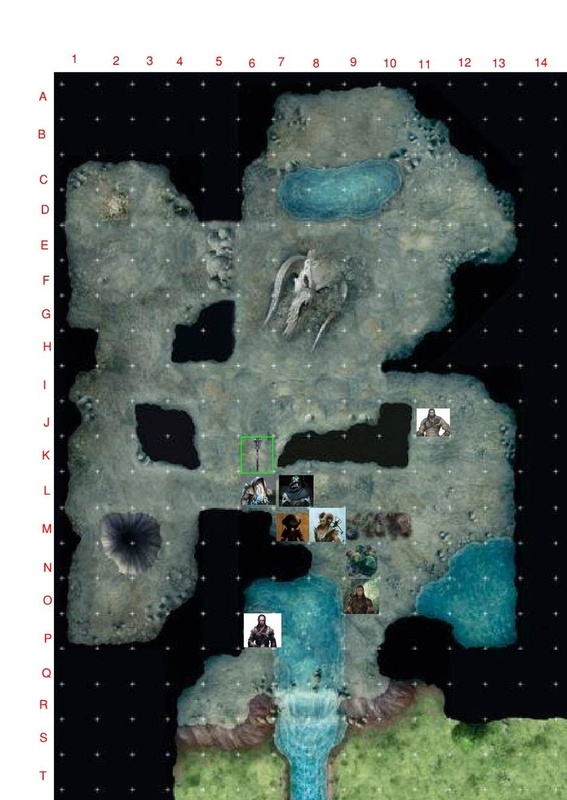 There isn't negative HP in 5e, so Ara was down to zero. I believe he currently has 16 HP. Let's say mucker corpse burns at J-6. It is on fire and hazardous terrain. Map Update. Also, there is a startling number of 'frog on fire" images on Google. hmm, created a nice little defensive position without even realizing it. Apologies for the game interruption, but please see the OoG thread for a news update. I want to keep you guys in the loop but don't want to clog the gameplay thread. It's been 35+ hours waiting on Chris. The companions get the feeling they are being watched. And with the added light of the burning mucker carcass, they spot a flicker of movement inside the dragonskull! There are some holes and cracks in the side of it. To the left of Nok is a pit, at least 15' deep. To his right, hiding at J-2, is a bullywug! This one is of the croaker type. This one of the croaker type. That is a miss. The croakers have a tougher hide than their brethren. As one of them was attacked, and Nok alerted his own companions, the croakers move out from hiding at the top of round 6. Croaker#2 at J-2 opens it's mouth and makes a Foul Croak at Nok. It is a close blast (15'), spewing disgusting black poison at the rogue. Nok needs to make a Con Save. Croaker#1 makes a standing leap from E-4, over the pile of boulders, to I-7. It makes a Foul Croak at Cyc. Need a Con Save from Cyc also. Okay, now Bru can go. And you are welcome to revise your post, since there was a retcon. Dragon Skull: The bullywugs found this enormous black dragon's skull in a nearby swamp and brought it here. The interior of the skull is large enough to house a Medium creature. The skull grants superior cover to any creature inside it. Bru's seething demeanor cools slightly as his rage passes, but he remains ready for combat. "Stay as safe as you can, mates. I'm going in." He says to Ara and Leir. He reaches back and brings forth his shield in preparation to enter the room ahead. He ducks around the corner and charges to I-8 (15'), ready to attack Croaker#2 recklessly with his battleaxe. Result of the throw of dice "1d8 +3" : 2 + 3 = 5 slashing damage if it hits. "Where is Nok?" Bru shouts. Cyc gets covered in sticky black goo, but he makes his save, and takes no poison damage. Bru recklessly slashes with his battleaxe, making the croaker bleed. Still need Con save from Nok. Quxx moves to L-5, then casts cantrip CREATE BONFIRE on Croaker/location I-7. Thanks for listing the spell descriptions. That is most helpful. Croaker makes his save. It's getting hot in here! Out from the pit, south from Nok, two oozes appear at M-2 and M-3. Ooze#1 moves to L-2 and attacks Nok with it's pseudopod: 16 to AC is a hit! Nok suffers 7 bludgeoning damage, and 7 acid damage. 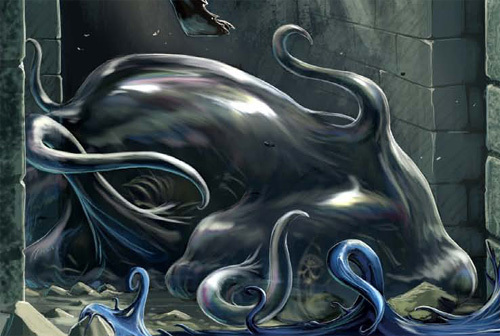 Ooze#2 moves to L-3 and also attacks with it's pseudopod, but misses. *Still needing a CON save from Nok. Cyc will advance to L-4, inserting himself between danger and his lightly armored karmic warrior friend. Nok uses his bonus action to cry out, "I've been SLIMED!" Nok made his save! He does not take poison damage, but nonetheless is covered in black goo and some grey ooze. Messy little peck. Cyc's combined attacks destroy grey ooze#2! Drusus will move to I-4, he will blast the baddie at I-7 with a Firebolt. well about damned time. Haven't had one of those in quite a while.